After spending a day in Portland with our hospitable friends John and Mary, and getting a ride back to the trail, I crossed over the Columbia River on "The Bridge of the Gods" and labored up the steep climb out of Cascade Locks, which is the lowest elevation of the trail. 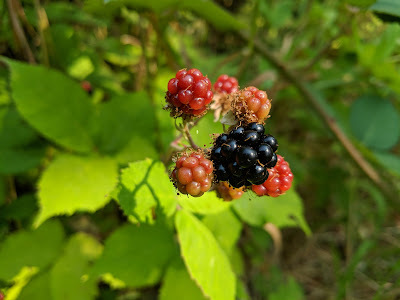 I vividly remembered the blackberries in this section from 2017 and was treated again this year to an "all you can pick" feast. The trail from Cascade Locks to Trout Lake primarily traverses a forest landscape, similar to Northern Oregon, but with the addition of a lot more rain, and more climbing. I enjoyed just "making miles" in the forest, and got to the Trout Lake access road just as some other hikers were getting dropped off, so I had a ride lined up straight away. Three of the hikers getting back on trail as I got off were ones that I knew from the desert section, and it was good to catch up with Crush, Ridge Route, and Shortcut. I did a quick turnaround at Trout Lake and got back on trail the same afternoon. Feeling refreshed, I blasted up the trail, and made it 16 miles in to where Ridge Route and Shortcut had pitched with an incredible sunset view of Mount Adams. They had actually hiked on another mile, but doubled back after reaching the overflowing Adams Creek, preferring a morning crossing when the snowmelt would be at it's low point. In the morning we found a safe crossing and continued on. This section includes the Goat Rocks Wilderness, with dramatic mountain views and strikingly beautiful waterfalls and meadows. For about a mile the trail has been carved into the top of a ridge, and this is appropriately named "The Knife's Edge," as there are steep dropoffs on both sides of the trail. As you might guess, this makes for fantastic views, as well as a slightly giddy sensation. As I hiked The Knife's Edge, I could see thick clouds of smoke from the "Miriam" fire to the east, and when I reached Tieton Pass, the PCT was closed, with a detour to the west. The 9.2 mile reroute ended at a busy roadway, and I caught a hitch up to White Pass where I could rejoin the PCT. White Pass was the temporary home base for the fire crews, and there were about 50 colorful backpacking tents in a field right at the Pass, presumably personal equipment for each firefighter. After a shower and laundry stop, I pressed on rather than spend a night at the noisy road area. Hiking on toward Snowqualmie Pass, I started with a short day, then had three days with about 6,000 feet of climbing each. I met Papa Oats on trail who referred to this as PUD (pointless up & down) since we were in forest almost the whole way, providing minimal payoffs at the top of each climb. As I headed toward a campsite at the end of one day, I spotted a Z-packs tent tucked into a small flat spot on the hillside. It was a remarkable choice of pitch locations, with a great view, and I stopped to admire it. After I made a comment, from inside the tent Mike Sauget recognized my voice, and quickly emerged. We had not seen each other since Kennedy Meadows, so it was great to catch up and we also made a plan to share a meal at Snowqualmie Pass. By the time I reached Snoqualmie Pass, my feet were sore, and I was ready for a break, having finished almost half of Washington. I checked into "The Summit Inn" for a two-night stay and have been luxuriating in the simple pleasures of town life. Tomorrow morning I will continue north toward Stevens Pass, which will be my next stop.